They all tel the same Story & profess to be Loyal citizens but whether to believe them or not is the question; Sam Sample passed through on the Cars last Friday on his way. Home. I did not see him but am Informed that his Regt have reenlisted. they wer Stationed at Huntsville Ala" forty five miles from this place. If you see him tel him to give me a call & I will give him the best bed I have which consists of a Soft Board & Some Blankets. when you write to Jim pleas remember me to him and I would be pleased to hear from him at any time. 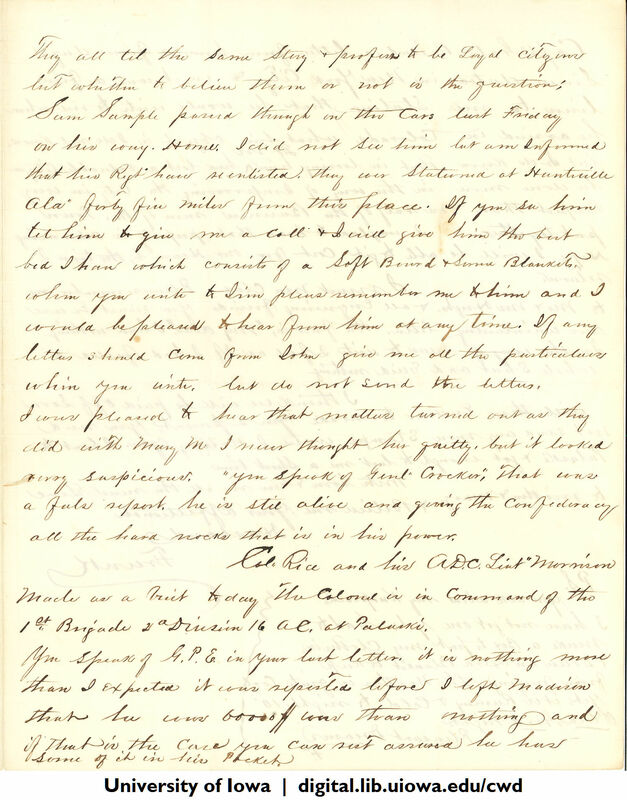 If any letters should Come from John give me all the particulars whin you write, but do not send the letters. I was pleased to hear that matters turned out as they did with Mary M I never thought her guilty, but it looked verry suspicious. "you Speak of Genl' Crocker", That was a fals report. he is stil alive and giving the Confederacy all the hard nocks that is in his power. Col. Rice and his A.D.C. Liut" Morrison made us a visit today The Colonel is in Command of the 1st Brigade 2d Division 16 AC. at Pulaski. You speak of G.P.E. in your last letter. it is nothing more than I expected it was reported before I left Madison that he was 60000$ was than nothing and if that is the Case you Can rest assured he has Some of it in his Pocket.